Hamilton Hugh Burrowes was the youngest son of William and Mary Burrowes. 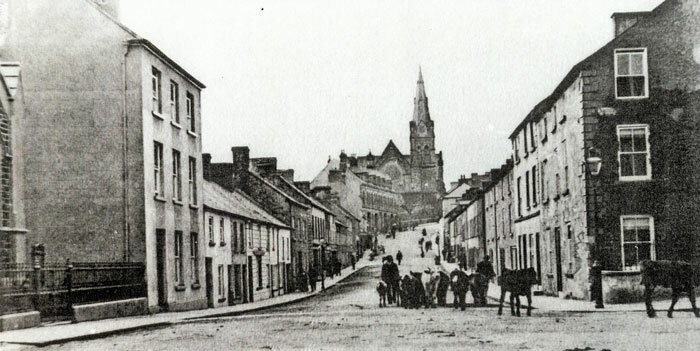 Hamilton was born in Dungannon in 1885. Hamilton attended the Royal School Dungannon from 1898 to 1900. The 1901 census reveals the family were living in Perry Street, Dungannon. His father William was a confectionery shop owner. He was also a Car Owner and Driver. Hamilton was not living with the family. Hamilton was living with the Anderson family in Lambeg, Lisburn. He was 15 years old and working as a Chemist's Apprentice. John Anderson was a Pharmaceutical Chemist. 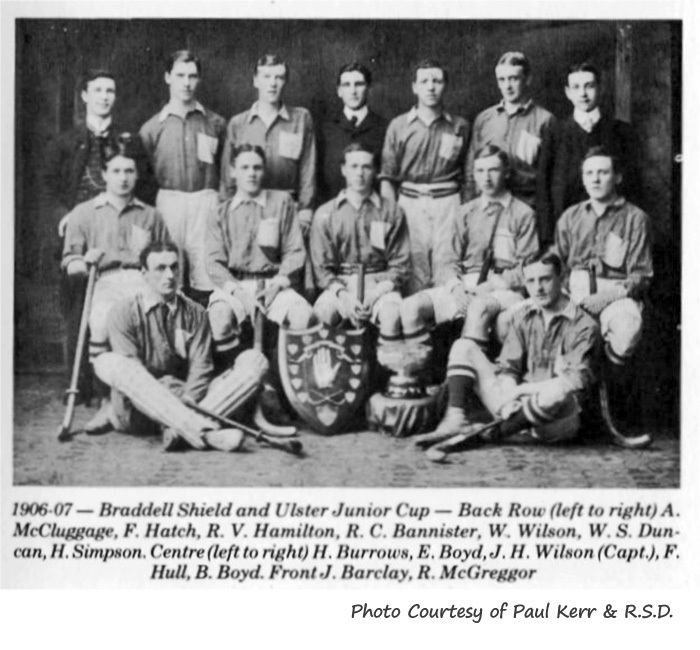 Hamilton Burrows played hockey for the recently formed (1901) Lisnagarvey, who were based in the Lisburn area. 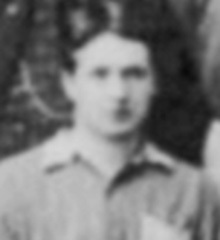 The photo above shows Lisnagarvey 2nd XI in the 1906-07 season. Hamilton is far left in the middle row. Hamilton emigrated to South Africa in 1909. 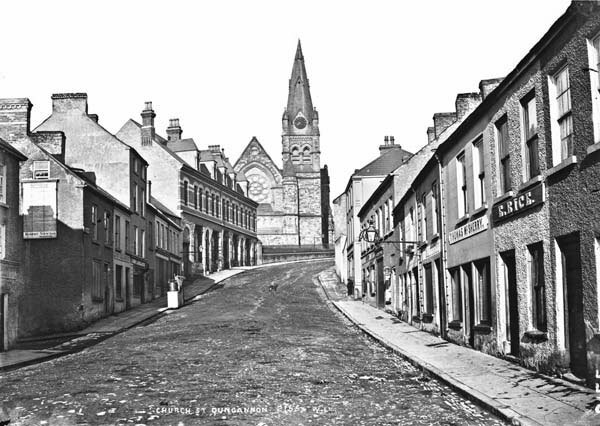 By 1911, Hamilton's father had died and he is no longer listed with the family who now lived in Thomas Street, Dungannon. The Royal School Dungannon book records that the school magazine from that time details that he was a Sergeant Dispenser with the South African Veterinary Corps. A Sergeant Dispenser was in effect, a pharmacist. Hamilton Burrowes served throughout the German South West Africa campaign in the Veterinary Corps. German South West Africa is now Namibia. 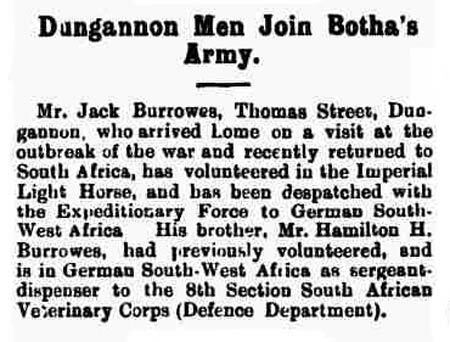 Mr Jack Burrowes, Thomas Street, Dungannon, who arrived home on a visit at the outbreak of the war and recently returned to South Africa, has volunteered in the Imperial Light Horse, and has been despatched with the Expeditionary Force to German South-West Africa. His brother Hamilton H Burrowes, had previously volunteered, and is in German South-West Africa as sergeant dispenser to the 8th Section South African Veterinary Corps (Defence Department). Trooper Hamilton Burrowes, pf the 5th Regiment south Africa Mounted Rifles, writing to his mother, Mrs Burrowes, ‘Hillside’, Dungannon, from Narudas, German South West Africa says:- ‘I am writing from one of the most outlandish places it is possible to find, situated amongst the mountains. To begin with, we sailed from Capetown by the Rufidji, a German prize boat, commandeered by the Government. We arrived at Linderitzbucht after a pleasant sea voyage, and marvelous to relate, no one was sick on the four day journey. Fifty-one men in an open truck, not to speak of our saddlery and kitbags. You can imagine there was not much sleep during the night time, and it was also bitterly cold. We travelled at a good pace, in fact the train broke all records for the distance, arriving six hours before the scheduled time. We stopped at Keetsmanhoof for three days, when we got orders to proceed to take Narudas (now part of Namibia), a place Headquarters knew was a fortified German police station, but did not know the distance or road to it, but only the direction where it was situated. 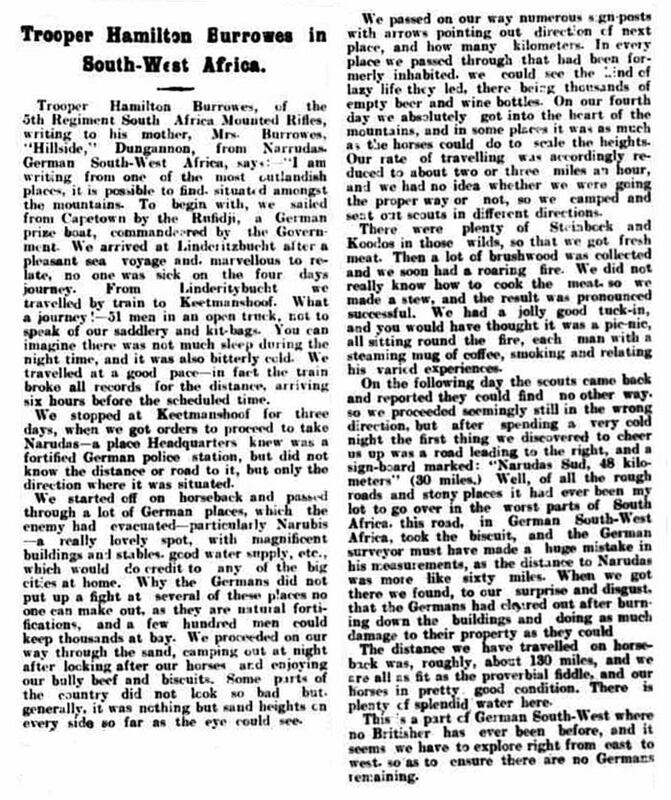 We started off on horseback and passed through lots of German places, which the enemy had evacuated, particularly Narubis, a really lovely spot, with magnificent buildings and stables, good water supply etc., which would do credit to any of the big cities at home. Why the Germans did not put up a fight at several of these places no one can make out, as they are natural fortifications, and a few hundred men could keep thousands at bay. We proceeded on our way through the sand, camping out at night after looking after our horses and enjoying our bully beef and biscuits. Some parts of the country did not look so bad but generally, it was nothing but sand heights on every side so far as the eye could see. We passed on our way numerous signposts with arrows pointing out direction of the next place, and how many kilometres. In every place we passed through that had been formerly inhabited, we could see the kind of lazy life they led, there been thousands of empty beer and wine bottles. On our fourth day we absolutely got into the heart of the mountains, and in some places it was as much as the horses could do to scale the heights. Our rate of travelling was accordingly reduced to about two or three miles an hour, and we had no idea whether we were going the proper way or not, so we camped and sent out scouts in different directions. There were plenty of Steinbuck and Kudus (African Antelope) in those wilds, so that we got fresh meat. Then a lot of brushwood was collected and we soon had a roaring fire. We did really know how to cook the meat, so we made a stew and the result was pronounced successful. We had a jolly good tuck-in, and you would have thought it was a picnic, all sitting around the fire, each with a steaming mug of coffee, smoking and relating various experiences. On the following day the scouts came back and reported they could find no other way, so we proceeded seemingly still in the wrong direction, but after spending a very cold night, the first thing we discovered to cheer us up was a road leading to the right, and a signpost marked ‘Narudas Sud, 48 kilometres (30 miles).’ Well of all the rough roads and stony places it has ever been my lot to go over in the worst parts of South Africa, this road, in German South West Africa, took the biscuit, and the German surveyor must have made a huge mistake in his measurements, as the distance to Narudas was more like sixty miles. When we got there we found, to our surprise and disgust that the Germans had cleared out after burning down the buildings and doing so much damage to their property as they could. The distance we travelled on horseback was roughly about 130 miles, and we are as fit as the proverbial fiddle, and our horses in pretty good condition. There is plenty of splendid water here. This is a part of German South West where no Britisher has ever been before, and it seems we have to explore right from east to west, so as to ensure there are no Germans remaining. A report in the Tyrone Courier depicts that Hamilton Burrowes was accidentally killed in Johannesburg in August 1916. He was actually killed on 25th July 1916, according to his death notice in the Mid Ulster Mail. Hamilton Burrowes was buried in New Cemetery, Johannesburg on 26th July 1916. The cemetery is now known as Brixton Cemetery. It is not known if he was in the Military at that time, but the fact that he is NOT listed in the CWGC would infer that he was not. More proof of this would be that although his brother John 'Jack' Burrowes is listed on Dungannon War Memorial, Hamilton is not. BURROWES – 25 July 25, 2015, at the Johannesburg Hospital South Africa, the result of an accident, Hamilton Hugh (Hammie) Burrowes, youngest son of the late William Burrowes and Mrs Burrowes, Hillside, Dungannon. Interred in the New Cemetery, Johannesburg 26th July. Deeply mourned. Early this morning a young man named Hamilton Burrowes, a chemist employed at the Imperial Pharmacy, Jeppes, was removed to hospital in a very precarious condition, as the result of a fall sustained by him in Castle Mansions, Eloff Street. He was attempting to slide down the bannisters of a stairway when he over-balanced and crashed onto the basement below. When picked up he was unconscious and he died a few hours after being admitted to hospital. The deceased young gentleman, who was very popular among all classes of the community, served his apprenticeship with Mr John S Anderson, The Medical Hall, Lisburn, and was an enthusiastic member of the Lisnagarvey Hockey Club and of the Lisburn Cricket Club, and also belonged to the local Masonic Lodge. He emigrated to South Africa about six years ago , and on the outbreak of the present war volunteered for active service. He took part in the German South West Africa campaign under General Botha, being first attached to the South African Veterinary Corps and afterwards with the South African Mounted Rifles. At the victorious conclusion of that campaign he returned to Johannesburg and had re-entered into business. His brother, Trooper Jack Burrowes, also served in German South West in the Imperial Light Horse, and is now in German East Africa with the 14th South Africa Horse under General Smuts. On Saturday, Mrs Burrowes, 'Hillside' Dungannon, received intimation from the War Office, that her second son Trooper Jack Burrowes, 4th South African Horse, had died on 23rd December from a malignant fever contracted during the present arduous campaign in German East Africa. 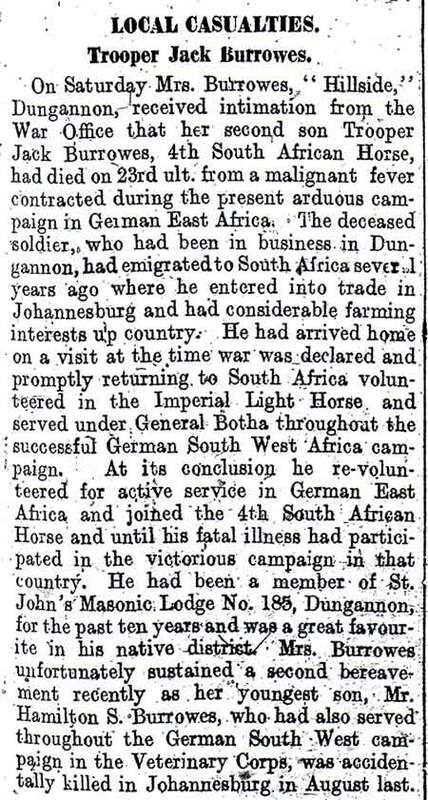 The deceased soldier, who had been in business in Dungannon, had emigrated to South Africa several years ago where he entered into trade in Johannesburg and had considerable farming interests up country. He arrived home on a visit at the time war was declared and promptly returning to South Africa, volunteered in the Imperial Light Horse and served under General Botha throughout the successful German South West Africa campaign. At its conclusion, he re-volunteered for active service in German East Africa and joined the 4th South African Horse and until his fatal illness, had participated in the victorious campaign in that country. He had been a member of St John's Masonic Lodge No 185, Dungannon, for the past ten years and was a great favourite in his native district. Mrs Burrowes unfortunately sustained a second bereavement recently as her youngest son, Mr Hamilton S Burrowes, who had also served throughout the German South west campaign in the Veterinary Corps, was accidentally killed in Johannesburg in August last. Both brothers are listed on the memorial plaque in Scotch Street (Dungannon) Presbyterian Church. Many thanks to Paul Kerr and the Royal School Dungannon for his intelligent research which uncovered our error and all the other information provided. There was a Private Hamilton Burrowes who served with the South African Infantry in France and was killed in an accident on 7 December 1917. This is NOT our Hamilton Burrowes and has created some confusion.